Stud Welding | R.J. Kates Co. 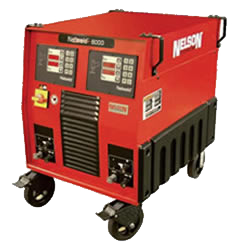 The Nelson Nelweld N1500i Stud Welder, seen on the left, supports the processes of Drawn Arc, Gas Arc, and Short-Cycle. Its a third generation all digital inverter system that delivers 50% more power than comparable products available and capable of driving more cable than comparable products available (100 – 600 feet). It has a stud range of 3/8″ to 3/4″. 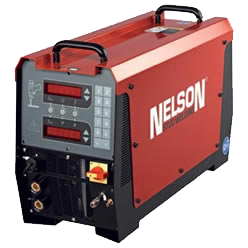 The Nelson Model 101/201 Series 6000 Stud Welders, seen on the right, is available as a single gun (101) or a dual gun (201) welding system with independent and step less time and current controls. Its stud range is 5/16″ through 1″. The Arcon Studhorse 1200 welds up to 1200A for up to 3/4″ (19mm) full base studs, headed or threaded, in an 80lb unit Studhorse welder. It can weld steel, stainless and aluminum. Some of its features are a low open circuit voltage of down to 8V, corrosion protection, runs on 30A slow blow fuse, and can be powered by 70KVA or 60KWA generator. Portable and mounted air compressors from 10 to 400CF for carbon arc or simple pneumatic tools. Single or in 4, 6, or 8-pack configurations of 300 Amps. and 400 Amps. inverter welders. This equipment overcomes the problems of welding joints near each other. Perform welding or cutting operations with a variety of track & trackless carriages. 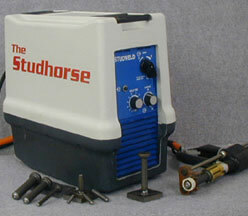 Portable, multi process power sources to go anywhere you need to MIG, TIG or Stick weld. Stud welding needs from 110V. capacitor discharge “CD” for pin welding to 1″. Through deck applications. Blowers remove fumes and dust from workspace; rod ovens keep your electrodes dry. For cutting metals from a thickness of gauge material up to a 2″ depth. 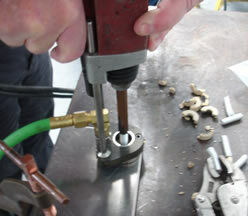 For TIG and Stick welding, these TIG power sources are intended for critical AC or DC TIG welding. We have a variety and depth of welding and cutting cabling and accessories. Unique tool that allows the target to be held and rotated while welding. 300-500 Amps. for Stick, MIG, self-Shielded, and Arc Gouging needs. Attach your drills to steel via their magnetic bases using either Hougen and standard Jacobs chucks. 5KVA to 300KVA power generators. Save up to 40% on fuel with our welding “multi packs”. 100-300 Amps. for Stick, MIG, and self-shielded welding plus auxiliary power. All the equipment you need to run temporary power services on site for your welding equipment. Runs virtually any MIG or self-shielded wire.